A client in SE Asia who is a major National oil operator had drilled more than 50 wells in an onshore basin, out of the 50 wells only 6 wells reached the target with difficulty and complications which led to either abandon the wells or loss of the string due to stuck pipe and collapse. The client approached the Fervid group for assistance in finding a solution and to try to understand the source of the issue for future well planning, as it was agreed upon that a pressure Ramp exists at a local formation present all over the Basin. The above image is from Presage. This is a Model that was created. * Presage is a Halliburton Trademark and IP. Select 12 wells from the field under study including the 6 well which reached the trouble zone. 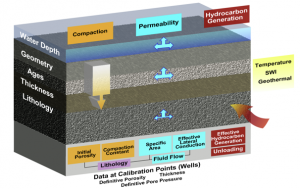 Build a 1D Pore Pressure (PP) and Fracture Pressure (FG) model and calibrate same for all the 12 selected wells. Train and mentor the client team on the above using Drillworks Predict with all its functionalities. Use Presage Basin modeling software ( a suit inside Drillworks) to better understand the distribution of Pore Pressure all over the basin. 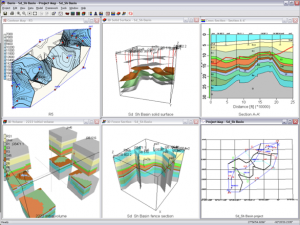 Train and mentor the client consultants on using Presage Basin modeling software. 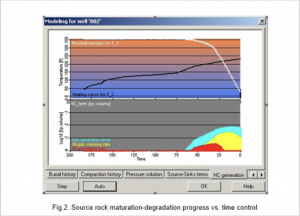 Perform wellbore stability study to find the reason for the stuck pipe and train and mentor client consultants on same using Geostress Package in Drillworks. Define the Best direction to drill future wells and the required mud weight to prevent kicks and well collapse. Fervid group experts with the client personnel collected all petrophysical and other information from 12 wells from the field including the 6 wells which penetrated the trouble zone. 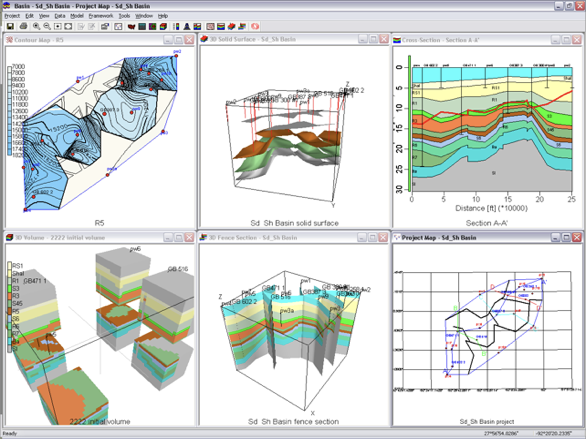 A basin model was built using Halliburton Presage application, with all available data and was tested with a known pressure at one blind well. The prediction was 0.5 – 1.0 ppg in general. A wellbore stability model was also built defining the best direction to drill future wells with the least mud weight necessary to prevent collapse and kicks. Results were discussed with client management and the model was approved. In the process the client personnel were trained on how to use these techniques and putting into use Drillworks software with all its suits.